In January 1982 the Cambridge News published a chart showing the roots of Cambridge rock. 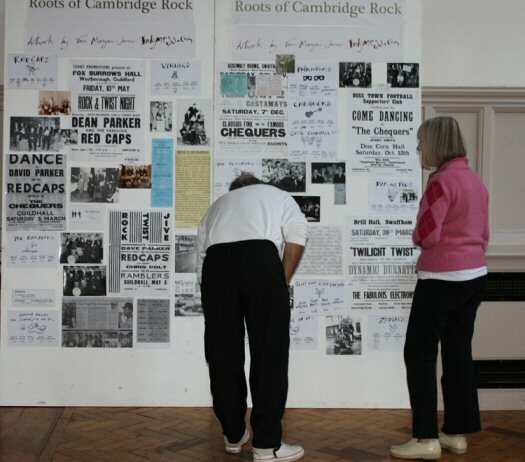 This was a family tree of bands between 1960-1982 that had formed Cambridge's rock and roll history. working behind the bar at the Eagle pub in Bene't Street. He had noticed that Cambridge was a very fertile place for bands with local working lads livening up the music scene and students rocking their way through college. 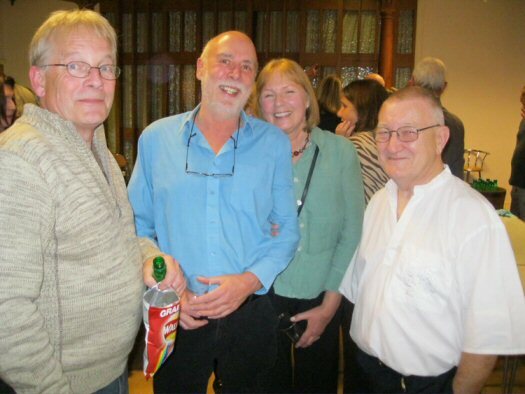 Some of those (left) include from left to right: Jack Monck (Stars), John Gordon (Joker's Wild), Mike Richardson (Forever Amber), Rado 'Bob' Klose (Pink Floyd Sound), Jenny Taylor (The Chequers), and John (Mark) Arnold (The Dawnbreakers). Graeme was very interested in genealogy and decided to take on creating a family tree chart as a project. He said at the time: “I was surprised to find out how much was going on locally. I got most of my information from Ivan Carling, who was doing the sound for the Soft Boys at the time. The complications were unbelievable. One practical difficulty is that musicians tend to forget things and often don't know the surnames of others. They can also be very vague about dates. Some bands are very loose and the Cambridge scene is so incestuous - people come and go with line-ups which often don't last more than a jam session. So there are bound to be mistakes and gaps - I can only ask musicians to be tolerant and try to understand the difficulties I faced with this project. It is ironic today that Cambridge, short of pop venues, has nurtured so many famous bands like: Pink Floyd, Yes, 10CC, Roxy Music, Foreigner, Procul Harum, Small Faces, Quiver, Elvis Costello's Attractions, The Clash, The Foundations, Katrina & The Waves - all have or formerly had links with Cambridge bands, some more tenuous than others". In late 2008,Escape Artists (a mental health issues charity) organised a two week festival in Cambridge celebrating the art and music of Syd Barrett. The festival went under the name of 'citywakes' with the patron being Rosemary Breen - Syd's younger sister. Stephen Pyle was asked to be the curator of the art exhibition at Anglia Ruskin whilst music workshops and concerts were to be held at St Paul's Church Centre and other venues. Steve decided to run a parallel event at St Paul's resurrecting the Roots of Cambridge Rock and with only a month's notice managed to persuade his good old friend and 60s band manager (Those Without) Warren Dosanjh to organise the event. Warren obviously had his own mental health issues at the time as he readily agreed! 60s music contacts were made, posters and photos borrowed, artwork and headlines created, and a small amount of sponsorship was gained towards refreshments. On Monday October 27th about 50 people attended this very informal get-together and jam session. The evening seemed to go well and many old friendships were re-kindled. Warren thought that this was the end of his input with Roots of Cambridge Rock - but he was wrong! The following year Mike Richardson, Dave Parker, Jenny Taylor, and Steve Pyle got together and decided it would be a great idea to organise a similar event but bigger, and this would hopefully raise some money for charity. Mick Brown agreed to design the posters/tickets and Warren was persuaded to come back in and help. Committee meetings were difficult to arrange and erratic - Dave and Warren consuming most of the time with somewhat amusing anecdotes of the 60s. 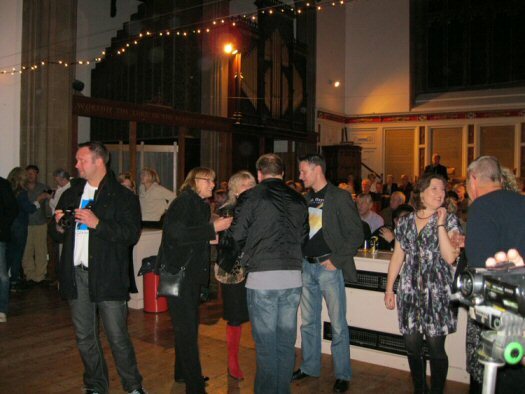 Finally the event took place again at St Paul’s Church Centre on Saturday October 30th. Overall things did go well but not perfectly. There was some justified criticism but only from musicians who never got a chance to play on the night. We have also been asked: “Why weren't all the musicians from the 60s - the foundation band were younger and the Norwegian band only played Pink Floyd?". Our answer is, that six months before, we had no equipment, no 60s musicians and had sold no tickets! Should we cancel? We decided to go ahead. A local band Los Kiosk Bears offered to loan their equipment and plug any holes in the music programme, whilst our Norwegian friends, Anderson Councils Syndicate(a PF tribute band) offered to play whilst on a visit to the UK. In a way these decisions were right as we had not had enough a response from 60s musicians. Where we did fail was not being able to satisfactorily allow all those 60s musicians who did show up to play. Hindsight is a great thing and we have learnt a lot from last year. However the feedback has been overwhelmingly good with one person saying: “It was a great nostalgic blast back to the 60s. Even the odd bits of chaos and the beer throwing incident brought back memories - did you organise that?" Interest in the RCR boards, "They've got that wrong!" After expenses the 2010 RCR raised £1116.00. We had decided to support three charities and these were each to receive a cheque for £372.00. 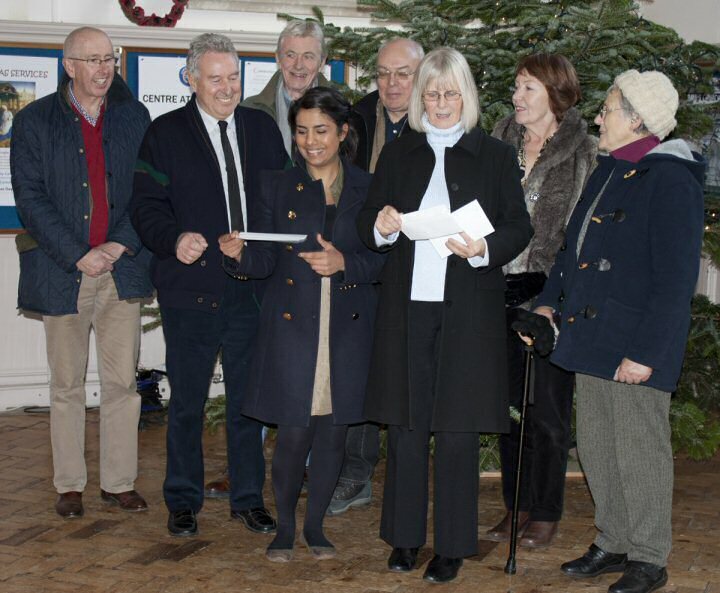 The presentations were made at St Paul's Church Centre on December 8th last year. Apart from one or two support guys, ALL the musicians performing at this year's RCR2 will be from Cambridge 60s bands. Overseeing and organising the evenings programme will be Tony 'Tiger' Middleton (The Chequers/Sundowners/White Satin), and Ivan Carling (who hasn't he played for?). Ivan (left), Tony (right), with two adoring fans in the middle.